A Google Home Mini for each of the four bedrooms. Since the fixtures in the bedrooms are solid LEDs and not light bulbs, I've had to wire in smart light switches in order to gain control of the lights through Google Assistant. So, Phase 2 of my Smart Home deployment began with the installation of my first Geeni TAP Smart Wi-Fi Light Switch. It's a light switch that doesn't require an additional hub to work. You can control it from the Geeni app and/or Google Assistant. Since my lights and wi-fi plugs are all managed through Geeni, I figured that I would stay with that structure. The good news is that I managed to install the light switch without passing any current through my body. The bad news is that, due to the nature of the neutral wiring in my house, the install was a pain in my rear. Most smart light switches currently on the market require the presence of a neutral wire in order to work. The one running though the bedrooms in my house doesn't offer much slack, so getting access to it so that I could twist it with the switch's wire was very difficult. The other issue is that the wire connectors included with the switch were too small to properly twist the paired wires together. I had to buy a pack of standard gauge connectors in order to twist the wires together properly. This meant that the switch box that houses the light switch had less room to hold the new Geeni switch. It took some creative placement in order to get it mounted flush with the wall. I eventually prevailed and I'm pretty happy with the results. The Geeni TAP Smart Wi-Fi Light Switch performs as expected. At $29.99 it's a bit more expensive than I would like, but, one can't argue with results, right? A "Lower Your Credit Card Interest Rate" scammer called me. He was trying to sign me up and get my credit card number. Whenever he asked a question, I hemmed and hawed and otherwise delayed so that I could keep him on the phone as long as possible. Just when he thought I was going to give him the credit card number, I ended up saying that my number was "5 1 7 GO F*** Yourself". My father has Parkinson's and is very nearly bedridden. In order to make life easier for him, my mother purchased a Ring video doorbell so that he can see who is at the door and converse with them via his phone or laptop. He'd like to eventually get to the point where he could touch a button and unlock the door, but first thing's first. Mom bought the Ring video doorbell without consulting me. Had I been informed of the decision prior to her purchase, I would have recommended the Nest Hello. Yet, part of any good challenge is to see how one can make do with what one has been provided with. Mom has had issues getting Ring to work reliably with my dad's phone, so, as the family tech expert my Smart Home skills were put to work this Christmas with the goal of getting the Ring video doorbell working. I got it working, it just took an age. The big thing that the Ring video doorbell has going for it is that you don't need to hook it in to an existing doorbell wire in order for it to operate. Ring can run on its own battery. That's a very attractive feature for folks like me who have houses without wired doorbells. The thing is, my parents' house has the necessary wiring. I don't know why their electrician elected not to use it. I can't imagine my mother would be too happy having to remember to recharge the Ring every-other-day. Setup isn't all that difficult. You connect Ring to your wireless network, register for an account, confirm your registration, download the app to your phone or computer and then sign in. Easy enough, except the Ring kept having issues either talking to my father's phone or connecting to the wireless network (despite a very strong signal). Still, it's not the setup that I have an issue with so much as Ring's overall performance. On my father's near-premium phone, Ring is slow to respond to commands and incredibly slow to show the video feed. This, I'm sorry to say, is unacceptable with my father's condition. He needs something more peppy. Myself, I'm so unimpressed with the Ring that I have actually contacted and electrician to run a wire to my doorway so that I can install a Nest Hello. With my successful installation of the Nest Gen 3 learning thermostat, Phase 1 of my smart home plan is complete. Wal-Mart was running a deal where you could buy a Nest 3 and a Google Home Hub for $300. Since the Nest Gen 3 usually runs about $250 and the Google Home Hub usually runs about $150, I felt that this was too good a deal to pass up. Plus, my electric company will give me a $125 rebate on the Nest Gen 3. Before you even buy a Nest, you need to check your existing thermostat wiring in order to make sure that your system is compatible. In order to do that, you just have to pull your thermostat off of the wall. Once that's done, take note of the letters pogs that your wires are going into. You will also want to note if you're using a cross over cable to connect two pogs together. As you can see in the picture of my own wiring, I've got a crossover between RC and RH. Otherwise, I've got wires going in to G, W, and Y (and instead of my Y wire being yellow, it's orange). Once you've got your wiring properly documented, head on over to the Nest website and check out the Nest Compatibility Checker. So, assuming you have a compatible system, installation is a snap. It took me less than 10 minutes. First and foremost, TURN OFF YOUR FURNACE before you begin the installation. You should have a service switch somewhere near your furnace, but, if you don't you can still turn it off at the breaker box. Once the furnace is off, get the wires out of your existing thermostat. You'll want to make sure you document which color wire goes in to which letter pog. Nest provides you with a bunch of stickers that you can wrap around the wires, but, it may be less of a hassle to just take a picture and refer back to it. My own system seems to have had at least one other thermostat attached to it at some point, so the area around the thermostat has some screw scarring. If this is the case for you too, you can make use of the included mounting bracket that will cover up various nicks and wounds around the thermostat. Then, you partially mount the Nest backing and place the wires into their corresponding places. There's no need for a screwdriver here. You just hold the pin down and push the wire in until it clicks. Once you get all of the wires in their proper places, you place the Nest control panel onto the backing and turn the power back to the furnace. Nest will then take you through the initial configuration which includes creating an account on Nest.com which will help you control the thermostat from the Internet and will also integrate it into Google Home. It hasn't even been 24 hours since my install, but I'm already loving this thing. At the very least, the ambient temperature sensor seems to be more accurate than the one that was in my old thermostat. And I like that I can set the thermostat over the Internet. It also has an option to use my phone's location to determine when I'm away and lower the home temperature accordingly. In order to use this feature properly, I'll need to get everyone's phone connected, but I haven't gotten buy-in from everyone in the house yet. I'm told it feels a bit too much like "Big Brother" watching. I say, if Big Brother wants to know when I'm driving to work and when I'm driving back, more power to him, so long as the house is at a comfortable temperature when I walk in. A Medicare supplemental insurance scammer called looking for me. She started off by talking about the upcoming raise in Medicare rates. I kept asking her why she was increasing my Medicare rate and telling her that I was on a fixed income. She asked me what supplemental Medicare plan I had, and I told her I had Medicare Part Q. She eventually got tired of trying to explain things to me and hung up. With the move to the new house this past weekend, I felt that it was a pretty good time to welcome a new dog to the family. 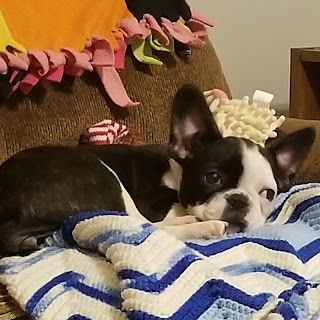 My daughter had been wanting a French Bulldog for quite some time, so I started looking into them. They're the result of the breeding together of English bulldogs and French rat terriers. The French Bulldog breed is a playful, intelligent breed with an even temperament. French bulldogs have issues breeding, owing mainly to their narrow hips, so, puppies can be very expensive. It's not uncommon to have to shell out $8,000 for one. I wasn't going to do that. I joined a few Facebook groups that connected breeders and buyers. I found that an overwhelming number of them were shipping dogs out of the Ukraine for about $2,000. I imagined showing up at the airport, meeting the dog minder and ending up with a Borzoi. "Vat? Iz dog, yes? Iz French! Dog iz born in France". No, thanks. I was tempted to tell my daughter "Let's just adopt a dog from the shelter. Maybe you'll get lucky and they'll have a French Bulldog". I did eventually find a breeder in Texas who was doing a mid-western caravan dropping of puppies. They had a few females available and we picked one that seemed from the video to have a playful personality. The price was fairly reasonable, and I wasn't asked to put down a deposit or sign any weirdo contracts. She was even willing to meet me at my new house. I declined that, however, as I still somewhat suspected that a beat-up white van might pull up to my house, a bunch of thugs would jump out, I'd have my money stolen and I'd be left with some worn out Neapolitan Mastiff. I instead suggested meeting at a well known, well traveled landmark in the area and arranged to have some friends blend in nearby as backup. About three hours before scheduled delivery, the courier called me to tell me that she was lost. She was tired as she had been driving all day, so would I agree to split the difference in distance and drive out to meet her halfway? My spider-sense started to tingle, but I agreed, suggesting that we meet at another well known landmark roughly halfway between us. I couldn't ask my entire spy network to accompany me, so I brought along my two favorite goons instead. We sat at the landmark for about 30 minutes eating drive-through food and keeping lookout for a van or truck with out-of-state plates. The courier called, saying that she couldn't find the landmark....which was easily visible from the highway. She then asked if I would be willing to meet her in a hotel parking lot that she had stopped at. I looked it up on Google Maps. It was well off the main drag but still somewhat decently traveled. Still, it was better to be cautious. I stopped about a block from the hotel and dropped my goons off with instructions to walk towards the lot but stay out of sight. If anything goes wrong, then SWARM!!! My preparations would prove to be unnecessary. Instead of a gang of Russian dog runners, I was met with a frazzled woman minding four puppies who just needed a good night's rest. I paid her the agreed upon fee, called the breeder to confirm the transaction and then was met with the cutest puppy ever put on this Earth. She has already turned out to be a fine addition to the family. She loves zipping around the house chasing after everyone. And she is so very quiet. I only just heard her bark for the first time last night when I put on the television to watch the last half of Season 2 of The Marvelous Mrs. Maisel. I had worried that she might take after Walter The Frenchie. But, thankfully, her bark has very little whine to it. So far. I closed on a house last week. The best part about it is that I was able to do it without cheating on my taxes or getting my mommy to co-borrow with me. Because that's how an adult does things, right? A few weeks before my final walk-through, I told the previous owner that she could feel free to leave any items that had been in the garage and I would take care of disposing of them. Along with some other odds and ends, there was a decent dining room table and chairs stored in there that I felt we could use for a few months until we get around to furnishing the dining room. After moving the dining room table out of the garage and into the dining room, I found a box tucked into a corner. It had obviously been there for quite some time, as it had been pretty well worn and faded. And inside that faded box? A pristine set of Christmas dinnerware. Someone had obviously opened the box, took one plate out to look at it, put that plate back in and then forgot about it. 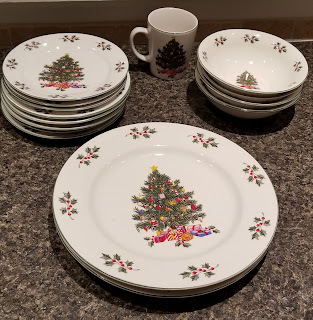 I imagine a previous occupant getting the Christmas plates as a gift, opening the box up for a round of halfhearted Ooohs and Aaahs and then deftly stashing it away while making a vague mental note to use the plates the next time that relative came over for the Holidays. In a way, finding these plates was kind of fitting. Christmas came early this year when the family was brought together under one roof. Our little band of misfits found a place to call home and these tacky plates are a good reminder of how even the most unexpected offerings that life throws at us have their place. Our place is together, with these plates in our cabinets.....very deep in our cabinets, but there nonetheless. So, we all gathered around the ramshackle dining room table and ate dinner from our Christmas dinnerware with smiles on our faces, laughter in our hearts, and joy in our souls. Myself, I decided to forgo the use of my usual coffee mug so that I could be the one who drank from the Christmas mug. And it was the best cup of coffee I had ever had. All These Plates....But Just One Coffee Mug? We ordered pizza tonight. It went well with the ice cream cake we were having for the birthday party. Normally, when I'd call the pizza place, I'd just whip out the cell phone and place the call. But, now that I have Google Home, my Google Assistant can do it for me. I merely said "Okay, Google: Call [Pizza Place]". Google Assistant confirmed the number, dialed them up, and put me through. I placed my order with them and, when they confirmed my number, they spat my cell phone number at me. What the what? How did Google Home know to use my cell phone number? Some folks believe that Google Home connects to your cell phone via Bluetooth and makes the call using your cell network. That's not the case. Google Home uses Voice-Over-IP technology (VOIP) to make calls. Phone call information is essentially the same thing as website information, streamed movies, MMORPG data, etc etc. The Internet doesn't natively know the difference between all that. It's all just data. So, it's not much of a task to send audio up and get audio down so long as you have two receivers in place (in this case, Google Home and a traditional land line phone) that can interpret the data properly. But why did the pizza place think I was calling from my cell phone? Well, that's the contact that's in the Google account that I use for Google Home. If you don't have a phone number tied to your account, Google Home will dial a number for you, but your number will come up as [Private] on the receiver's Caller ID. You can also input any number you want to have show up on the Caller ID, but you have to have access to that number because Google will text or call the number in order to confirm that you're not spoofing.